Quick thinking and thorough training saved a senior Las Vegan’s life and earned her three rescuers top honors by the American Red Cross . 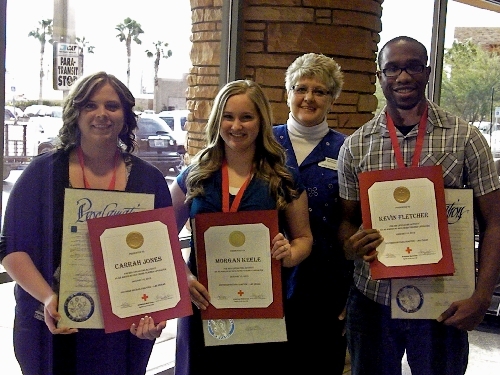 On Feb. 7 , Kevin Fletcher , Morgan Keele and Carrah Jones , lifeguards at the Cora Coleman Senior Center , 2100 Bonnie Lane, were given Red Cross medals of honor, Red Cross recognition certificates and the Clark County Board of Commissioners’ Proclamation of Recognition for their heroism in January . The staffers were alerted to an emergency in the women’s locker room one morning, Fletcher said. The Centennial Hills resident said a woman, who was in her 70s, had fallen off a bench and was unconscious. Keele, the first responder, took the lead, and Fletcher and Jones executed a long-practice emergency action plan, Fletcher said. Fletcher dialed 911, cleared the nearby pool and secured the area while waiting for paramedics. The woman regained consciousness shortly after and was alert when paramedics brought her to a nearby hospital , Fletcher said. Details of what led to the woman’s emergency, her identity and condition are unknown. The Red Cross medal of honor is the highest honor from the Southern Nevada chapter of the organization, spokesman Lloyd Ziel said. The group was nominated after mention of the rescue was made at a quarterly American Red Cross meeting, Ziel said. Clark County Commissioner Tom Collins spoke at the Feb. 7 awards ceremony about the importance of CPR skills and called for others in the community to learn life-saving skills. For more information about CPR training, visit redcrosslasvegas.org or call 369-3674 . Contact Centennial and North Las Vegas View reporter Maggie Lillis at mlillis@viewnews.com or 477-3839.